Bramley House prides itself on the standard of care and facilities offered to residents. At Bramley House all your needs are catered for. Light and spacious en-suite rooms, coupled with beautifully maintained and secure gardens, provide a peaceful and relaxing home. Daily activities and the facilities available in the beautiful village of Mere ensure residents are kept active, engaged and feel part of the local community. Bramley House provides a home and professional care for the elderly including end of life care and is able to care for those living with the mild symptoms of Dementia. Residents are encouraged to surround themselves with family and friends and visitors are welcome to visit at any time. Our comfortable and spacious lounges provide the perfect space to sit and enjoy the views of the gardens and the countryside beyond. 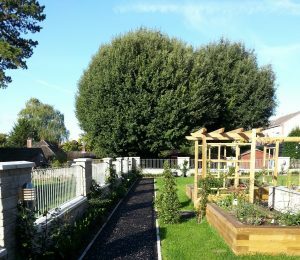 With its pond and pergola, the garden is a peaceful place to walk and enjoy the flowers (all chosen by our residents). 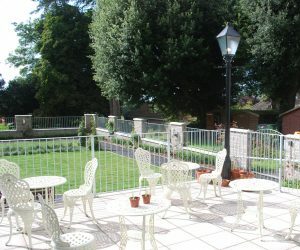 our patio provides a comfortable space to sit outside and enjoy the sunshine.